Another female fronted symphonic, gothic, and melodic heavy metal band from Finland? There must be something in the water. Obviously, you're wondering how Dotma, and their debut release Sleep Paralyses (yes, it's spelled incorrectly in the English) is comparable to the original and their peer, Nightwish. I'm sure Dotma's expecting the critics and listeners to make the comparison. Operatic, nearly undecipherable, female vocals? Check. Lavish, symphonic, and bombastic arrangements? Check. Occasional male, sometimes gruff, vocals? Check. What are we missing? A generous dose of power metal. It' there. Classic heavy metal fiery guitar solo? Yep. It's all on track, and it's all good, except for the simple fact that you've probably heard it all before. This style is still quite persuasive, especially in Scandinavia and Europe. Nevertheless, lovers of the genre will find Dotma's Sleep Paralyses fulfilling and entertaining. Just don't look past the obvious comparisons (already made). With this said, I really enjoyed the classic metal edge that appears in most every song, specifically the soaring, but always too brief (at least for me), guitar solos. Vocalist Johanna Lesonen aspires to her peers and succeeds. Yet, at times, it seems she has only one level: soaring and more soaring. She's more persuasive in the quieter moments, when the music is so grand and glorious, and she more accessible as on Indian Fall. Otherwise, Sleep Paralyses is standard stuff. While hardly reinventing the wheel, Dotma knows their chosen genre and does quite well. Top picks include the aforementioned Indian Fall, Silent Sunshine, the expansive Kingdom of the Sky, and the lavish, sometime intricate, Memory Worth Dying For. For fans of the symphonic/gothic metal style ala Nightwish, Within Temptation or even early Lacuna Coil, will be pleased. Recommended. 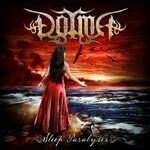 Lovers of the symphonic/gothic will find Finland's Dotma and their debut, Sleep Paralyses, fulfilling and entertaining. Just don't look past the obvious comparisons to that other Finnish band.